A new way to pay for electric car charging shows a possible future of open easy charging station access. Electric car owners could have an easier time accessing public charging stations thanks to an announcement made this week by Recargo. Its PlugShare application can now be used to pay for charging sessions on SemaConnect electric charging stations. While the announcement itself is fairly small scale, the ramifications are large if Recargo is successful at forging similar agreements with other charging networks. The "Pay With PlugShare" feature is now available in the PlugShare smart-phone application. The company claims it is the easiest and most universal public charging system available. PlugShare is already the most widely used application for locating electric car charging stations. But now electric car drivers will not only be able get charging station locations, but will be able to pay for the charging session through the same application. This capability is available today by using PlugShare at one of the 300 SemaConnect stations across the US or Canada. The problem that Recargo is looking to solve is the current dilemma of proprietary member-only charging station networks. The J1772 charging connector is a standard implemented on every electric car on sale in America, well, except for the Tesla Model S whose drivers have to use an adapter to use J1772 charging stations. Even though it's a standard, electric car owners face a fragmented charging station market. Charging station networks routinely require a membership card in order to use one of their stations. In some cases a driver could arrive at a station on their last electron and be out of luck unable to get a charge. "We	heard from drivers and charging networks who want to make paying for charging as easy as we've made finding a place to charge. We thought if it’s possible to pay for a parking meter with a credit card, why not the same for a charging station?" said Brian Kariger, CEO of Recargo Inc. "We are pleased to launch Pay With PlugShare with SemaConnect and finally give drivers a simple solution to charging payment. Ultimately, we want the industry to thrive and our service to encourage EV adoption by providing the smoothest plug-in experience for all." To the electric car driver, the PlugShare application now includes a "Pay with PlugShare" icon for stations at which one can, well, use the PlugShare application to pay for the charging session. Tap the icon, the PlugShare application takes care of authenticating with the charging network which owns the station, and then the driver can start their charging session. The goal is similar to two other announcements this year. The first, Collaboratev, is a company jointly launched by ChargePoint and ECOtality whose plan is to create what amounts to a payments settlements company similar to the ATM Networks. Their plan is interesting but Collaboratev's existence is deeply threatened by the bankruptcy of ECOtality. The other, Intercharge, is focusing on European charging station networks and utilizes a QR code at participating charging stations. In both those cases the model is akin to the "roaming" concept in cell phone or ATM machine usage, and even includes a roaming fee paid to the company which facilitates access to the charging station. 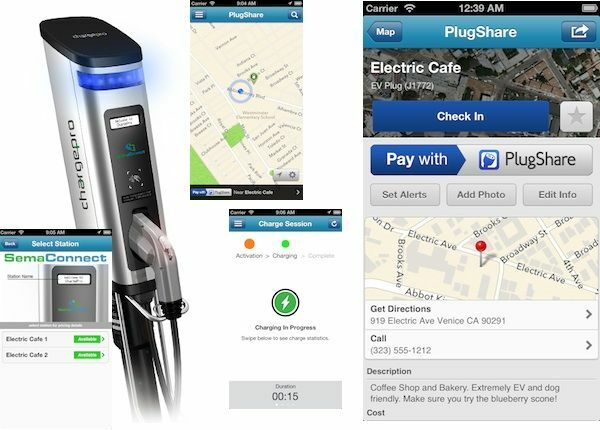 Pay With PlugShare is easy to integrate with charging station networks. It can be linked to the existing payment infrastructure owned by a participating charging station network, or payment can be handled by PlugShare's system. Recargo, the corporate parent of PlugShare, is talking with the other charging station networks to sign them up. They don't see any conflict in co-existing with Collaboratev or other payment settlement networks. Instead they see the possibility of multiple options to pay for charging sessions. The key motivating idea is that by erasing barriers to using the various charging station networks, the value of all the public charging stations goes up. If the public charging station network is easier to use, electric car drivers will have an easier time recharging in public, will have an easier time navigating through cities with their electric car, and their electric will become more valuable to them.